Penny for your thoughts, uncle," said Miss Drewitt, as they sat at dinner an hour or two after the departure of Mr. Vickers. "H'm?" said the captain, with a guilty start. "You've been scowling and smiling by turns for the last five minutes," said his niece. "I was thinking about that man that was here this morning," said the captain, slowly; "trying to figure it out. If I thought that that girl Selina——"
He took a draught of ale and shook his head solemnly. "You know my ideas about that," said Prudence. "Your poor mother was obstinate," commented the captain, regarding her tolerantly. "Once she got an idea into her head it stuck there, and nothing made her more angry than proving to her that she was wrong. Trying to prove to her, I should have said." Miss Drewitt smiled amiably. "Well, you've earned half the sum," she said. "Now, what were you smiling about?" "Didn't know I was smiling," declared the captain. With marvellous tact he turned the conversation to lighthouses, a subject upon which he discoursed with considerable fluency until the meal was finished. Miss Drewitt, who had a long memory and at least her fair share of curiosity, returned to the charge as he smoked half a pipe preparatory to accompanying her for a walk. "You're looking very cheerful," she remarked. The captain's face fell several points. "Am I?" he said, ruefully. "I didn't mean to." "Why not?" inquired his niece. "I mean I didn't know I was," he replied, "more than usual, I mean. I always do look fairly cheerful—at least, I hope I do. There's nothing to make me look the opposite." Miss Drewitt eyed him carefully and then passed upstairs to put on her hat. Relieved of her presence the captain walked to the small glass over the mantelpiece and, regarding his tell-tale features with gloomy dissatisfaction, acquired, after one or two attempts, an expression which he flattered himself defied analysis. He tapped the barometer which hung by the door as they went out, and, checking a remark which rose to his lips, stole a satisfied glance at the face by his side. "Clark's farm by the footpaths would be a nice walk," said Miss Drewitt, as they reached the end of the lane. The captain started. "I was thinking of Dutton Priors," he said, slowly. "We could go there by Hanger's Lane and home by the road." "The footpaths would be nice to-day," urged his niece. "You try my way," said the captain, jovially. "Have you got any particular reason for wanting to go to Dutton Priors this afternoon?" inquired the girl. "Reason?" said the captain. "Good gracious, no. What reason should I have? My leg is a trifle stiff to-day for stiles, but still—"
Miss Drewitt gave way at once, and, taking his arm, begged him to lean on her, questioning him anxiously as to his fitness for a walk in any direction. "Walking'll do it good," was the reply, as they proceeded slowly down the High Street. He took his watch from his pocket, and, after comparing it with the town clock, peered furtively right and left, gradually slackening his pace until Miss Drewitt's fears for his leg became almost contagious. 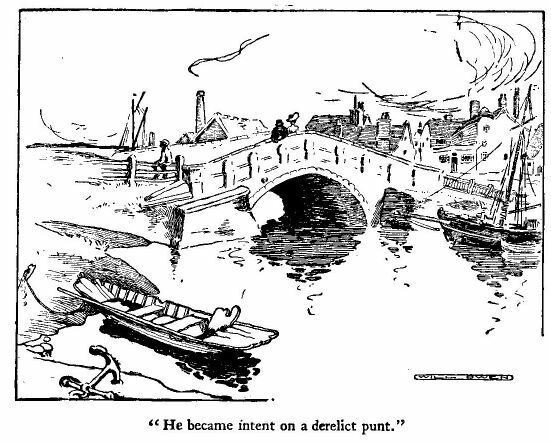 At the old stone bridge, spanning the river at the bottom of the High Street, he paused, and, resting his arms on the parapet, became intent on a derelict punt. On the subject of sitting in a craft of that description in mid-stream catching fish he discoursed at such length that the girl eyed him in amazement. "Shall we go on?" she said, at length. The captain turned and, merely pausing to point out the difference between the lines of a punt and a dinghy, with a digression to sampans which included a criticism of the Chinese as boat-builders, prepared to depart. He cast a swift glance up the road as he did so, and Miss Drewitt's cheek flamed with sudden wrath as she saw Mr. Edward Tredgold hastening towards them. In a somewhat pointed manner she called her uncle's attention to the fact. "Lor' bless my soul," said that startled mariner, "so it is. Well! well!" If Mr. Tredgold had been advancing on his head he could not have exhibited more surprise. "I'm afraid I'm late," said Tredgold, as he came up and shook hands. "I hope you haven't been waiting long." The hapless captain coughed loud and long. He emerged from a large red pocket-handkerchief to find the eye of Miss Drewitt seeking his. "That's all right, my lad," he said, huskily. "I'd forgotten about our arrangement. Did I say this Sunday or next?" "This," said Mr. Tredgold, bluntly. The captain coughed again, and with some pathos referred to the tricks which old age plays with memory. As they walked on he regaled them with selected instances. "Don't forget your leg, uncle," said Miss Drewitt, softly. Captain Bowers gazed at her suspiciously. "Don't forget that it's stiff and put too much strain on it," explained his niece. The captain eyed her uneasily, but she was talking and laughing with Edward Tredgold in a most reassuring fashion. A choice portion of his programme, which, owing to the events of the afternoon, he had almost resolved to omit, clamoured for production. He stole another glance at his niece and resolved to risk it. "Hah!" he said, suddenly, stopping short and feeling in his pockets. "There's my memory again. Well, of all the—"
"What's the matter, uncle?" inquired Miss Drewitt. "I've left my pipe at home," said the captain, in a desperate voice. "I've got some cigars," suggested Tredgold. The captain shook his head. "No, I must have my pipe," he said, decidedly. "If you two will walk on slowly, I'll soon catch you up." "You're not going all the way back for it?" exclaimed Miss Drewitt. "Let me go," said Tredgold. The captain favoured him with an inscrutable glance. "I'll go," he said, firmly. "I'm not quite sure where I left it. You go by Hanger's Lane; I'll soon catch you up." He set off at a pace which rendered protest unavailing. Mr. Tredgold turned, and, making a mental note of the fact that Miss Drewitt had suddenly added inches to her stature, walked on by her side. "Captain Bowers is very fond of his pipe," he said, after they had walked a little way in silence. Miss Drewitt assented. "Nasty things," she said, calmly. "So they are," said Mr. Tredgold. "But you smoke," said the girl. Mr. Tredgold sighed. "I have often thought of giving it up," he said, softly, "and then I was afraid that it would look rather presumptuous." "So many better and wiser men than myself smoke," exclaimed Mr. Tredgold, "including even bishops. If it is good enough for them, it ought to be good enough for me; that's the way I look at it. Who am I that I should be too proud to smoke? Who am I that I should try and set my poor ideas above those of my superiors? Do you see my point of view?" Miss Drewitt made no reply. "Of course, it is a thing that grows on one," continued Mr. Tredgold, with the air of making a concession. "It is the first smoke that does the mischief; it is a fatal precedent. Unless, perhaps—How pretty that field is over there." Miss Drewitt looked in the direction indicated. "Very nice," she said, briefly. "But what were you going to say?" Mr. Tredgold made an elaborate attempt to appear confused. "I was going to say," he murmured, gently, "unless, perhaps, one begins on coarse-cut Cavendish rolled in a piece of the margin of the Sunday newspaper." Miss Drewitt suppressed an exclamation. "I wanted to see where the fascination was," she indignantly. "And did you?" inquired Mr. Tredgold, smoothly. The girl turned her head and looked at him. "I have no doubt my uncle gave you full particulars," she said, bitterly. "It seems to me that men can gossip as much as women." "I tried to stop him," said the virtuous Mr. Tredgold. "You need not have troubled," said Miss Drewitt, loftily. "It is not a matter of any consequence. I am surprised that my uncle should have thought it worth mentioning." She walked on slowly with head erect, pausing occasionally to look round for the captain. Edward Tredgold looked too, and a feeling of annoyance at the childish stratagems of his well-meaning friend began to possess him. "We had better hurry a little, I think," he said, glancing at the sky. "The sooner we get to Dutton Priors the better." "Rain," said the other, briefly. "It won't rain before evening," said Miss Drewitt, confidently; "uncle said so." "Perhaps we had better walk faster, though," urged Mr. Tredgold. Miss Drewitt slackened her pace deliberately. "There is no fear of its raining," she declared. "And uncle will not catch us up if we walk fast." A sudden glimpse into the immediate future was vouchsafed to Mr. Tredgold; for a fraction of a second the veil was lifted. "Don't blame me if you get wet through," he said, with some anxiety. They walked on at a pace which gave the captain every opportunity of overtaking them. The feat would not have been beyond the powers of an athletic tortoise, but the most careful scrutiny failed to reveal any signs of him. "I'm afraid that he is not well," said Miss Drewitt, after a long, searching glance along the way they had come. "Perhaps we had better go back. It does begin to look rather dark." "Just as you please," said Edward Tredgold, with unwonted caution; "but the nearest shelter is Dutton Priors." He pointed to a lurid, ragged cloud right ahead of them. As if in response, a low, growling rumble sounded overhead. "Was—was that thunder?" said Miss Drewitt, drawing a little nearer to him. "Sounded something like it," was the reply. A flash of lightning and a crashing peal that rent the skies put the matter beyond a doubt. Miss Drewitt, turning very pale, began to walk at a rapid pace in the direction of the village. The other looked round in search of some nearer shelter. Already the pattering of heavy drops sounded in the lane, and before they had gone a dozen paces the rain came down in torrents. Two or three fields away a small shed offered the only shelter. Mr. Tredgold, taking his companion by the arm, started to run towards it. Before they had gone a hundred yards they were wet through, but Miss Drewitt, holding her skirts in one hand and shivering at every flash, ran until they brought up at a tall gate, ornamented with barbed wire, behind which stood the shed. The gate was locked, and the wire had been put on by a farmer who combined with great ingenuity a fervent hatred of his fellow-men. 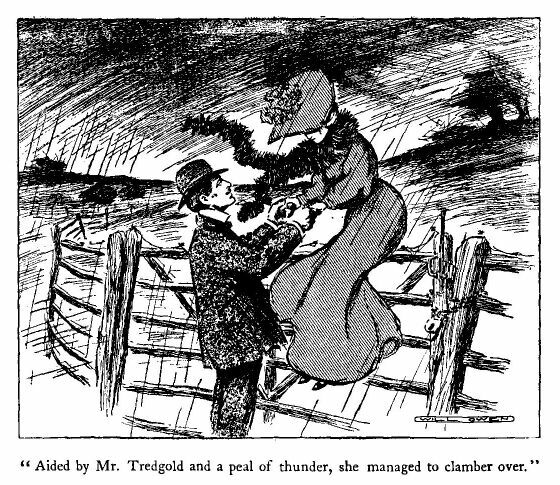 To Miss Drewitt it seemed insurmountable, but, aided by Mr. Tredgold and a peal of thunder which came to his assistance at a critical moment, she managed to clamber over and reach the shed. Mr. Tredgold followed at his leisure with a strip of braid torn from the bottom of her dress. The roof leaked in twenty places and the floor was a puddle, but it had certain redeeming features in Mr. Tredgold's eyes of which the girl knew nothing. He stood at the doorway watching the rain. "Come inside," said Miss Drewitt, in a trembling voice. "You might be struck." Mr. Tredgold experienced a sudden sense of solemn pleasure in this unexpected concern for his safety. He turned and eyed her. "I'm not afraid," he said, with great gentleness. "No, but I am," said Miss Drewitt, petulantly, "and I can never get over that gate alone." Mr. Tredgold came inside, and for some time neither of them spoke. The rattle of rain on the roof became less deafening and began to drip through instead of forming little jets. A patch of blue sky showed. "It isn't much," said Tredgold, going to the door again. Miss Drewitt, checking a sharp retort, returned to the door and looked out. The patch of blue increased in size; the rain ceased and the sun came out; birds exchanged congratulations from every tree. The girl, gathering up her wet skirts, walked to the gate, leaving her companion to follow. Approached calmly and under a fair sky the climb was much easier. "I believe that I could have got over by myself after all," said Miss Drewitt, as she stood on the other side. "I suppose that you were in too much of a hurry the last time. My dress is ruined." She spoke calmly, but her face was clouded. From her manner during the rapid walk home Mr. Tredgold was enabled to see clearly that she was holding him responsible for the captain's awkward behaviour; the rain; her spoiled clothes; and a severe cold in the immediate future. He glanced at her ruined hat and the wet, straight locks of hair hanging about her face, and held his peace. Never before on a Sunday afternoon had Miss Drewitt known the streets of Binchester to be so full of people. She hurried on with bent head, looking straight before her, trying to imagine what she looked like. There was no sign of the captain, but as they turned into Dialstone Lane they both saw a huge, shaggy, grey head protruding from the small window of his bedroom. It disappeared with a suddenness almost startling. "Thank you," said Miss Drewitt, holding out her hand as she reached the door. "Good-bye." Mr. Tredgold said "Good-bye," and with a furtive glance at the window above departed. Miss Drewitt, opening the door, looked round an empty room. Then the kitchen door opened and the face of Mr. Tasker, full of concern, appeared. "Did you get wet, miss?" he inquired. Miss Drewitt ignored the question. "Where is Captain Bowers?" she asked, in a clear, penetrating voice. The face of Mr. Tasker fell. "He's gone to bed with a headache, miss," he replied. "Headache?" repeated the astonished Miss Drewitt. "When did he go?" "About 'arf an hour ago," said Mr. Tasker; "just after the storm. I suppose that's what caused it, though it seems funny, considering what a lot he must ha' seen at sea. He said he'd go straight to bed and try and sleep it off. And I was to ask you to please not to make a noise." Miss Drewitt swept past him and mounted the stairs. At the captain's door she paused, but the loud snoring of a determined man made her resolve to postpone her demands for an explanation to a more fitting opportunity. 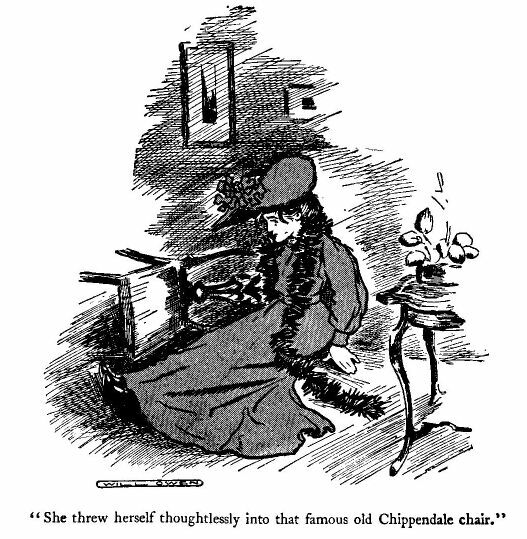 Tired, wet, and angry she gained her own room, and threw herself thoughtlessly into that famous old Chippendale chair which, in accordance with Mr. Tredgold's instructions, had been placed against the wall. The captain started in his sleep.